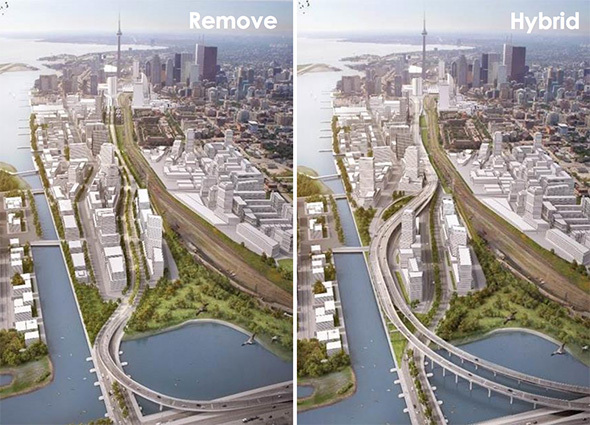 Tearing down Toronto’s Gardiner East Expressway would remove a hulking blight from downtown, improve access to the waterfront, open up land for walkable development, and save hundreds of millions of dollars compared to rebuilding the highway. But that didn’t convince the City Council. In a 24-21 vote yesterday, the Council opted to rebuild the aging Gardiner with some minor modifications instead of pursuing the “boulevard” option that would have removed a 1.7-kilometer segment of the highway. Replacing the elevated road with a surface street would have cost $137 million less upfront (in Canadian dollars) than rebuilding it, and nearly $500 million less in total costs over the next 100 years. But history and experience don’t support Tory’s view. The removal of center-city highways like the Embarcadero in San Francisco, the Miller Highway in New York, and the Park East in Milwaukee shows that drivers quickly adapt by choosing new routes, consolidating trips, or opting for different modes of travel — and carmageddon doesn’t materialize. Toronto’s chief planner, Jennifer Keesmat, supported removing the Gardiner, as did the city’s top public health official, a long roster of former Toronto mayors and planners, the Council for Canadian Urbanism, and all the City Council representatives who represent areas that the disputed section of highway cuts through. Against Tory and the representatives of Toronto’s outer districts, that wasn’t enough. Have no fear, Toronto is at its core, utterly opposed to ever changing anything. Before this ever takes hold, a new mayor will be elected, to cancel the project and ensure that nothing ever changes. The same would have been true if they had chosen to tear it down as well. living (and running, strolling) near manhattan’s west side, i thank the gods that the elevated highway was torn down back in the day. with the success (financial and aesthetic) of that teardown and the Embarcadero, i simply do not understand how every city does not simply tear down every elevated highway as far as the eye can see. It’s a serious blight. What a horrible waste of space – with the added blight factor of creating some intersections that are extremely dangerous for peds and cyclists. just wait until New Yorkers realize this truth and agitate for removing the elevated abomination from 57th to 72nd. I imagine, because like Torontonians, most people who live in a city, believe their city is different than every other city. You know, despite overwhelming evidence. I talked with someone in Toronto about this and their response to every single piece of evidence I gave was “well Toronto is different”. They even had the gall to argue that SF’s transit system was much better than Toronto’s which is why they could afford to lose the embarcadero freeway. At that point, I laughed and gave up talking any sense into them. Here is the Emmbarcadero before and after, with the freeway and then with the boulevard instead. Any preference? Great decision Toronto! Future generations will marvel at your wisdom & forward thinking. I’m still a little bummed they didn’t go with the “Gunderson Option” but oh well. If Toronto is anything like it’s US cousins, they should fight for the future. I can’t believe how many cities still have waterfront freeways! Walls on the water! But there are, and worse, I can’t believe we’re still having the debate whether we should rebuild them. I hope the residents get a say and I how they are more progressive than their representatives. It really makes sense once you see it in action. It seems to me that once you tear down the Gardner wall, there’s still a wall of condos blocking access to the waterfront. Citiwide VMT is down a third? Just Manhattan-brooklyn traffic is down a third? Or traffic on a bridge that undergoes frequent partial closures during a multiyear construction project is down? Closing the park row exit because NYPD fears car bombs is some of it too. 2003-2013 the number of motor vehicles travelling between Brooklyn and Manhattan declined from ~362k to ~359k. Queens-cbd is down a bit more, but still less than 4%. Nj-cbd is down 14%, but tolls are up significantly in that time. Traffic from uptown is down ~15%, and a fair bit of roadspace has been reallocated. You seem to imply that in a few years traffic on the BQE would be low enough to run on the surface. If the highway is maintained, and capacity off the highway is maintained, and pricing remains the same, there is no chance of that happening on its own. There would be significant costs in lost mobility and increased travel time if you were to remove the highway. That doesn’t mean the benefits don’t outweigh the costs. But don’t pretend the costs don’t exist. Depending on unpredictable variables, you can sometimes see the tunnels’ south portals from the Hudson River pedpath. If you don’t know what they are, you might confuse them with Amtrak’s tunnel, which is farther east. I tend to agree. As much as some people might loathe NYC’s elevated highways, at least in the outer boroughs they’re probably a necessity for commerce given the size of the city. It just takes too long to go 10 or 15 or 20 miles on congested surface streets. And the same line of thinking is why I’ve repeatedly been advocating for a system of bike highways. The highways serve a valid purpose in that they pull a lot of traffic off local streets. I’d much rather have delivery vehicles en route to Manhattan or elsewhere on highways than surface streets. That said, we still need to radically reduce private car use in this city, even if we don’t remove highways. I’m a little surprised at your numbers. Anecdotally during the last 20 years it seems local traffic by me has at least doubled during much of the day, even if trips to the CBD have declined. Either that, or the roads just exceeded the tipping point where a few more vehicles added caused free flowing conditions to break down. Tunnels are a great idea. At that same time you’re putting a highway in a tunnel, you can probably build a parallel subway for much less than it would otherwise cost. That would be a great option for the entire part of the LIE which runs in city limits. Besides removing a abomination which cuts the area in two, it would put subway service in a place where it currently doesn’t exist. While we’re at it, stick in a bike tunnel as well to offer a non-stop trip into Manhattan in all kinds of weather to the residents of Queens. The Embarcadero Freeway was a stub leading to a corner of the city, whereas the Gardiner is a central part of the Greater Toronto freeway network, carrying more than 140,000 vehicles per day, and serving through traffic (the Embarcadero acted as an expressway that augmented ramps from I-80, the Gardiner is a through route). peak VMT is long behind us and is declining. Brooklyn Bridge traffic will continue to decline a percent or so each year. Only when trucks and private cars stop getting massive subsidies will we know exactly what the true economic value of their movement is. Streetsblog had a article a few week ago on the gigantic subsidizes long haul trucking enjoys. Numerous studies over the years calculate private cars enjoy approx. $8 a gallon subsidy. any good subsidized that much will be over consumed. traffic congestion would clear up reasonably quickly if drivers paid $11 a gallon. During the debate, a councillor challenged the city planner to name a city that had successfully removed an elevated freeway — other than NY or SF. That’s the mentality we’re dealing with here. The Gardiner isn’t used as a through route. I think it was less than 3% of the traffic which drives through on this section. This section needed to be demolished. Streetfilms is a resource that is not used enough by planners, engineers and urban designers to support for factual evidence. A video says 1 million words! Our industry will not resonate with the common man unless conveys a vibrant representation of infrastructure that enhances peoples lives. Streetfilms are not “evidence”. They are propaganda. It is okay to produce propaganda or activist material, but that doesn’t meant because you support the idea it is necessarily true.